While mainstream medicine can sometimes offer quick solutions to pesky symptoms, sometimes the best options for healing what ails us can be found within nature. Alternative and natural therapies seek to address the root causes of ailments, and support longer-term wellness overall. Osteopathy can treat a number of issues, from chronic pain and headaches to acute injuries. Rather than only treating symptoms superficially, osteopathy is based on detecting issues in the muscles, tendons, or ligaments that could be causing your problems. It’s a hands-on approach that uses stretching and manipulation of the spine to relieve symptoms, and also helps to prevent recurring pain and discomfort. Reflexology involves the application of pressure to specific points on the feet and hands. It’s believed that these points correspond to different body organs and systems. Applying pressure could improve general health by improving blood circulation and activating nerves. It can also send signals that help balance the nervous system or release chemicals such as endorphins that reduce pain and stress. The main purpose of detoxification is to cleanse toxins that might be physically stored in your body as a result of diet, lifestyle, stress, pollution and other factors. One form of this is colon cleansing, which is a gentle cleaning of the digestive tract and bowels. This improves bowel function, digestion and nutrient retention, which in turn can positively affect energy levels and skin condition, and even stimulate the immune system, among other benefits. The Emotional Freedom Technique (EFT) recognises that physical symptoms may be manifestations of underlying emotional stress. EFT’s aim is to help patients release negative thoughts and emotions and thus relieve pains and diseases, as well as emotional and mental issues. Naturopathy is a holistic approach that combines both traditional and conventional medicine. It recognises the intricate relationship between the body, mind, and soul and aims promote physical, mental and spiritual wellbeing. In naturopathy, natural medicines, such as herbal medicine and flower remedies, may be used to detoxify and boost the body’s natural immunity, and thereby treat a host of ailments. 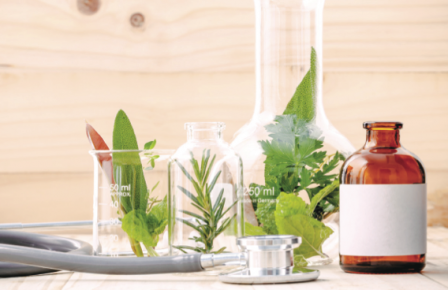 Developed in the 18th century, the theory behind homeopathy is that giving patients small doses of natural substances (that could in fact cause their symptoms in bigger doses) could cure the symptoms. Homeopathic medicines are made from natural materials from animal, mineral, and vegetable kingdoms. It can bring increased immunity and vitality to patients. Craniosacral Therapy (CST) is a hands-on treatment that focuses on realigning the head and spine to release pressure on the nervous system and relieve nerve pain. It enhances the function of the central-nervous system and is known to help with stress, migraines, insomnia and emotional balance. Aromatherapy uses essential oils to promote physical, mental and emotional wellbeing. Extracted from aromatic plants, essential oils have been proven to have anti-inflammatory, anti-infectious and anti-viral properties, among many other uses. Through inhaling and applying the oils, the body and mind can be uplifted and relaxed, bringing mental and psychological benefits. Hypnotherapy may have been stigmatised as a way to get people to do things against their will, but practitioners hold that it can be beneficial in getting to the root of certain behaviours such as addictions or overeating, by communicating with the unconscious mind. A hypnotherapist gets the patient into a state of deep relaxation and heightened consciousness, making the mind more open to positive suggestions. Many people are faced with allergies; food, pollen and dust are all common allergens. Symptoms can range from runny nose to rashes to serious swelling of the respiratory tract. Conventional medicine offers anti-histamine to counteract the reactions produced by the body to fight the allergens. The Natural Allergy Elimination Technique (NAET) uses a mixture of allopathy, acupuncture, chiropractic, kinesiology and nutrition to help get rid of allergies for good. With a wealth of ancient wisdom behind it, the effectiveness of Traditional Chinese Medicine (TCM) is the topic of much buzz in recent years. Treatments can include herbal remedies as well as techniques such as cupping, which uses suction cups to invigorate blood circulation, release muscle tension and resolve toxins, and acupuncture, known to provide relief for a range of acute and chronic health problems including insomnia and stress management, water retention, digestive issues, and high blood pressure. Negative Ion Treatment, popular in Japan, taps into natural ionic energy for all kinds of results: it can effectively reduce fat and toxins, activate hormones, prevent skin aging, improve blood circulation, promote metabolism, enhance the immune system, improve sleep quality and help with problems like muscle pain and constant colds. The treatment newly available in Sai Kung uses radium mineral rock from Hokkaido that you simply lie on for a relaxing, stress-free experience. This healing technique is based on the principle that we can channel energy by means of touch, to activate the natural healing processes of the body and restore physical and emotional wellbeing. Practitioners undergo intense training, and can treat symptoms from minor aches to major health concerns, such as heart disease, digestive disorders, respiratory and skin problems, by creating deep relaxation and moving energy through the body.